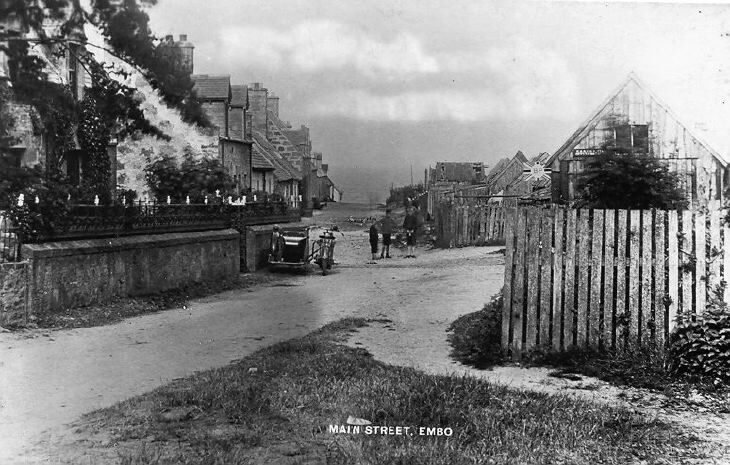 Postcard with view of Embo Main Street, published by John A Ross, Post Office, Embo. Road is unpaved. Garage with BP sign on the right, motorcycle and sidecar on the left, three boys standing in road. Unused. Main Street, Embo? There never was such a street! Perhaps John Ross was trying to do a bit of PRO work for Embo. The house with the stone wall topped with fancy wrought iron railings on the left was the property of John Ross, Post Office who at the turn of the century was the coxswain of the Embo lifeboat. The street on the left which then continues towards the sea is Gate Street. It was probably called Gate Street because further back it is the street that leads out of Embo and there used to be a level crossing gate where it crossed the old Highlands Railway’s Dornoch/Mound railway line. One of my most enduring childhood memories was in about May 1944 seeing a battalion of rifle carrying and turbaned Hindustani soldiers marching down Gate Street with their officers riding alongside them on very large and smart horses...not the draft horses that we were used to seeing. They continued marching down the street and on reaching the sea they went North towards the Little Ferry and then out of our sight. The street that can be seen going off to the right is Hall Street. It was probably called Hall Street because in older days it ended at the then village hall but now continues down to Grannies. The wooden garage on the right was in the 1940s and 1950s disused and it was the gathering place for all the village youngsters and the turning point for passenger buses servicing the village. Farm tractors bringing Embo potato pickers back to the village in the autumn also used the garage as a drop off point. I remember meeting the tractors there on many occasions to help carry the potatoes that the workers got as a bonus on top of their wages. These potatoes were supposed to be for one "boiling" but many of the workers were confused as to how many people the boiling should be for and a wheelbarrow was often needed to transport them! For lunch the workers were often fed chicken pastry pies which were delicious but we children claimed that they were in fact crow pies. That did not stop us clamouring for any lunch leftovers or wondering why the number of crows in the area stayed constant. These Embo workers harvested potatoes in all the farming areas inland from the village..they would travel as far as Golspie in the North and Bonar Bridge in the South. It was always very interesting listening to their opinions as to the kindnesses and hard heartedness of their various employers and also to the mischief that many of the workers got up to make their back breaking work bearable.